Set your table with Elegance! Enjoy our new line of premium designed plastic plates with a hammered border. Available in 10.25", 9", 7" plates and bowls as well. We also have coordinating tumblers and wine goblets. 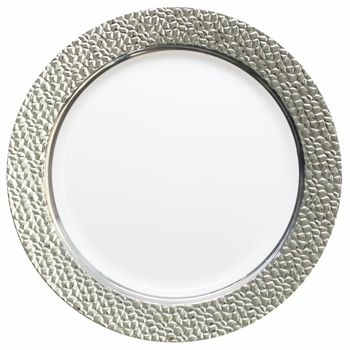 Hammered Collection 10 1/4" Clear w/ Silver Hammered Border Banquet Plastic Plates 10ct. Hammered Collection 9" Clear w/ Silver Hammered Border Luncheon Plastic Plates 10ct. Hammered Collection 7" Clear w/ Silver Hammered Border Salad / Cake Plastic Plates 10ct. Hammered Collection 12oz. Clear w/ Silver Hammered Border Plastic Bowls 10ct. Hammered Collection 10oz. Clear Plastic Cup with Silver Hammered Border 10ct. Hammered Collection Clear w/ Silver Hammered Border Plastic Wine Goblets 10ct.